The Chinaman is missing in Rathkeale. I have looked for him in vain. He is gone, and people in Rathkeale worry that he may be lost forever. All that remains of the Chinaman is a large mark on the first floor of the façade of what was once Fitzgibbon’s pub at the east end of the Main Street. 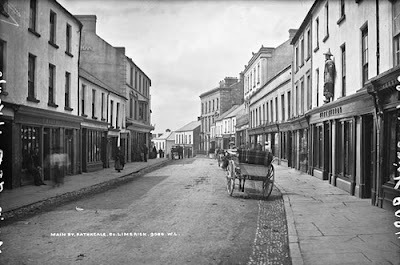 For almost 200 years, the Chinaman had been one of the most celebrated residents of Rathkeale, and was a listed artefact. His story is one of piracy, drama and adventure on the high seas. According to one version of the legend, a cargo of tea arrived from China in Foynes – or in Tarbert – in the early 19th century – some versions of legend proffer a much earlier date of 1736, although the pub was built 90 years later in 1826. The Mikado was in port for about a fortnight as the cargo was being unloaded. Meanwhile, the captain, Wongyil, and his crew spent their time in Fitzgibbon’s public house in Rathkeale. However, word came from Tarbert that a pirate ship had arrived and that the pirates were plundering the town and district. One story says Wongyil was so grateful he donated money to the people of Rathkeale for helping him fight off pirates. Another version says the people of Rathkeale, Tarbert and Foynes were so grateful to him for fending off the raiding pirates that they had a wooden image made of Wongyil made and erected it over the door of Fitzgibbon’s pub. Until the pub was repainted in recent weeks, the facia of the pub retained the date 1826, and a large mark on the the first floor indicates where the Chinaman stood for almost 200 years. He was a protected statue, although at one time he was missing an arm and his hat was badly weathered. But he stood the test of time – and weather – for the best part of two centuries. During the Tostal celebrations in 1953, a postcard was issued by the Chinaman Bar. In 1992, when the pub was known as Foley’s, a ceremony celebrated Rathkeale’s links with China. The First Secretary at the Chinese Embassy in Dublin, Wang Jiashou, unveiled the restored statue of the Chinaman at Foley’s Bar watched by Joe Dunleavy, chairman of Rathkeale Community Council. Outside, Rathkeale Brass Band entertained everybody; inside, Theresa Foley and her family entertained a large number of guests. Later, Wang Jiashou and his wife were entertained to lunch in Castlematrix Castle before visiting Desmond Creations Jewellery Factory and the Shannon Meats factory. In a limited-edition print in 2010, Austin Bovenizer celebrated the ‘Rathkeale Streetscape’ bringing together images from the streetscape and buildings of Main Street, Rathkeale. With artistic licence, he reintroduced old landmarks, including the People’s Bakery, Sparling’s shop and the Chinaman, to his digital montage and collage. But by then, the Chinaman had disappeared from the Main Street. My first photograph shows the fading Fitzgibbon name on the fascia of the former pub this month [June 2017]. Despite being repainted in recent weeks, the mark on the façade continues to indicate where the statue of the Chinaman once stood facing the street. Some people in Rathkeale believe the Chinaman had been moved to the back of the premises, either to save him from the weather while he awaited conservation, or to prevent him from being stolen. Two years ago, in February 2015, Joe Dunleavy asked in the Rathkeale Newsletter: ‘Where is the statue of the Chinaman at the present time?’ It would be an occasion to celebrate in Rathkeale if the statue was put back in the place that had been his home for such a long time.